I began my studies at Laurier in 2015 as a college transfer student and completed a Bachelor of Arts in Society, Culture and Environment in December of 2017. This upcoming fall semester I will be starting a Master of Arts in Social Justice and Community Engagement. I currently serve as a research assistant for the Resilient Communities Research Collaborative, led by Dr. Brenda Murphy and Dr. Bryce Gunson. My research focuses on community-based approaches to social and environmental justice. At present, I am examining the non-timber forest products (NTFP) industry. More specifically, I am investigating how wild edibles such as blueberries contribute to the social, cultural, environmental, and economic well-being of Ontario's rural Indigenous and settler communities. It is an exciting time as there are numerous innovative entrepreneurial endeavours selling value-added forest food products to niche markets throughout the province and beyond. Still, we should ensure that the NTFP sector develops in a sustainable and equitable manner. My recent capstone project, supervised by Dr. Nick Garside, analyzes the counterculture movement of dumpster diving for food. Many people are sickened by the thought of hopping into a dumpster to reclaim food, but we have much to learn from the brave individuals who participate in an activity most of us would not even dare to try. My project is all about changing attitudes and re-thinking our relationship with food. How we think about food may be the greatest obstacle to decreasing our waste. There is a general attitude that food waste is inevitable. Although some waste is impossible to avoid, supermarkets can do better and corporations need to be held accountable. Dumpster diving at supermarkets is a great way to highlight just how tragic and fundamentally flawed our industrial food system is. Millions of people are currently unaware as to where their next meal will come from, yet our grocery stores waste massive amounts of edible food. Much of this discarded food is deemed unsafe to eat, when in reality most of it is still safe to consume. Sadly, it is often cheaper and more convenient for stores to throw out their unsold produce than it is to donate it. We need more financial incentives and social pressure to get this food into the hands of people who need it most. While some vulnerable individuals dumpster dive out of necessity to obtain food, a growing number are motivated by political reasons. Divers do not just encourage the public to be mindful of the choices we make with respect to food waste; they seek to challenge pre-existing capitalist structures and conventional ways of thinking. We must shift power from producers to consumers by establishing more localized, self-sustaining food systems. I hope my research inspires young people to become active, engaged citizens in their communities. Laurier Brantford hosted its second annual Undergraduate Research Celebration Week called Academic, Creative, and Engaged Research Showcase (ACERS) March 12-16, 2018. 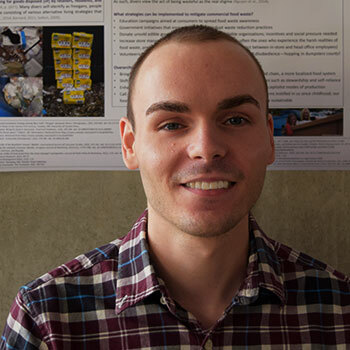 Brock Vaughan displayed a research poster on March 15, 2018 as part of this showcase.